General placement ad rates are $24 per column inch in 1 edition. All prices listed are for 1 edition. 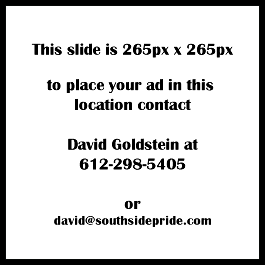 Southside Pride is printed on a tabloid size paper (actual size is 11.25 x 16 inches) . We use a 5-column format. Click the Size/Price chart for a printable copy. Placement of the same ad in a second edition of Southside Pride in the same month will earn a 10% discount on the second ad. Placement of the same ad in the third edition will earn a 25% discount. Rates are higher for the high profile back page. Please call for rates. An additional 20% charge will guarantee placement on a particular page, corner of a page, or section. Southside Pride provides spot color and 4-color on selected pages. Rates vary. Cost for inserts is $60 per 1,000 inserts (6 cents each). Minimum of 7,000. Inserts are 8.5″ by 11″ glossy color sheet, inserted into copies of the paper.